Scientists in China have developed a device that can control the production of multiple emulsion systems. This system could be used to encapsulate incompatible drug ingredients and to design multi-compartment materials, they say. 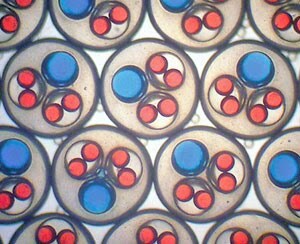 Multiple emulsions are liquid systems in which emulsion droplets are placed inside each other, each droplet smaller than the last, creating 'levels'. Microfluidic devices have been designed to produce such systems, but controlling the number, size and ratio of droplets at each level is difficult, especially when developing a system that has different types of emulsion droplets at the same level. Control over such multi-compartment levels would allow more precise encapsulation and the development of more advanced materials. The team tested their system using different coloured oil droplets in water. The device - a droplet maker, connector and liquid extractor - can be arranged in different combinations to generate different emulsions. As the oil droplets move through the system, they merge in the main channel to form the multi-component emulsions. Alberto Fernandez-Nieves, an expert in microfluidics at the Georgia Institute of Technology, US, is also impressed with the work. 'This beautiful work provides a very clever way to extend the applicability and uses of glass-based microfluidics,' he says. The team now intend to explore the full potential of their device and promote its application in different areas.